TSP1B spotlight incorporates an independently adjustable LED spotlight with integral non replaceable LED for illuminating different areas of the your display making it a perfect lighting solution for fairs and exhibitions. 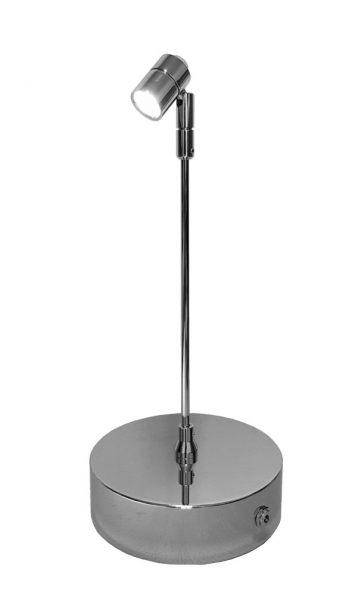 The TSP1B has an integral switch and charging point mounted in to the weighted freestanding base. The base of the spotlights is weighted to ensure stability and is manufactured with a protective felt pad to protect your display. As with most LED spotlights they emit very little heat so there is no risk to potential customers while browsing your display. Display Lighting can also offer bespoke variations of these standard product so if you require a modification, such as a different height, we will be more than happy to help, please speak to one of our sales team.